It’s easy to get sucked into having Thai when you have an urge for Asian food, and of course there’s nothing wrong with a green/red/blue curry. But the world’s largest continent has quite obviously got much more to offer than that. Warung Tujuh is an authentic Indonesian eatery, the first half of the name referring to the street food stalls popular over there. But the restaurant is nothing like a stall, instead having simple, stylish décor. The cut-price lunch menu offers two dishes for £7, from which we select a sate daging starter – small charcoal grilled beef pieces on a skewer – which sits in a drizzle of soy with a side bowl of peanut sauce. The nasi goreng looks like an unprepossessing upturned bowl of rice, but once split open it reveals a well stuffed interior of large, juicy prawns, soft chicken pieces and thinly sliced veg. Spicy enough to leave a notable aftertaste, it’s addictive and extremely filling. Also from the cheap menu we have soto ayam, a chicken noodle soup that is fresh and zingy and with sliced egg, beansprouts, vermicelli noodles and some interesting ingredients we don’t recognise. 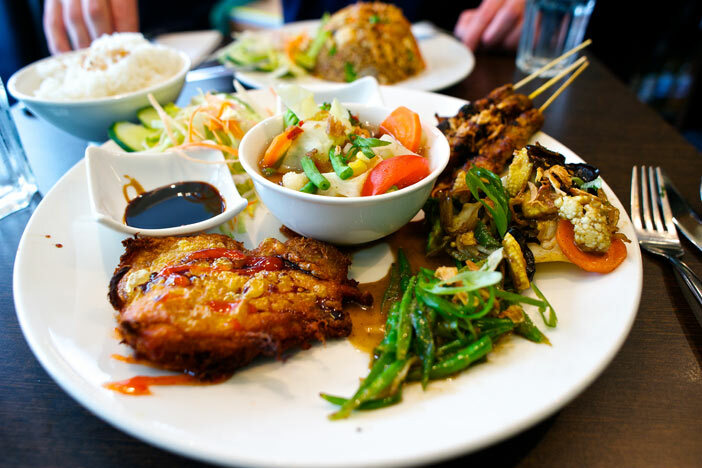 The nasi campur tasting plate (£11.50) is huge, with lots of different flavours working together. The mild vegetable broth in the centre balances the tangy chilli sauce of the fried chicken fillet. There’s also salad, more creamy vegetable dishes and beef skewers. As we don’t want the satay sauce they make us a delicious thick soya dip for them. One of these dishes plus a starter will challenge even the greediest of diners. You really can’t argue with the lunchtime set menu for value, and the platter was equally full of food for the money. With lots of fresh ingredients, and many tastes, both new and familiar, Warung Tujuh is a great place to explore a lesser known cuisine. The waitress thought she recognised us, though she wasn’t sure where from, and was stationed right by our table while we tried to surreptitiously take photos with our oversized DSLR. So maybe sussed.